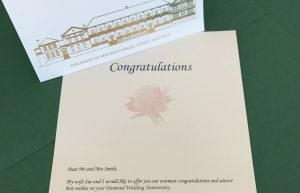 My office can organise congratulatory messages for 50th, 60th, 65th, 70th Wedding Anniversaries and for 80th, 90th and 100th birthdays from the Governor, Prime Minister, Premier and Federal MPs. The Queen and Governor-General will also send special messages for 60th Wedding Anniversaries and 100th birthdays. You will need to provide supporting documentation like a birth certificate or marriage certificate (photocopies of originals are accepted, if certified by a Justice of the Peace). If these are not available you can provide a statutory declaration. To ensure messages arrive in time for the special celebration, three weeks advance notice is needed for processing. Please contact my office on (02) 6555 4099 to apply for these messages, or download the form below.